We are pleased to announce an exhibition of Sonic Cathedral artwork as part of their ongoing 10th anniversary celebrations. 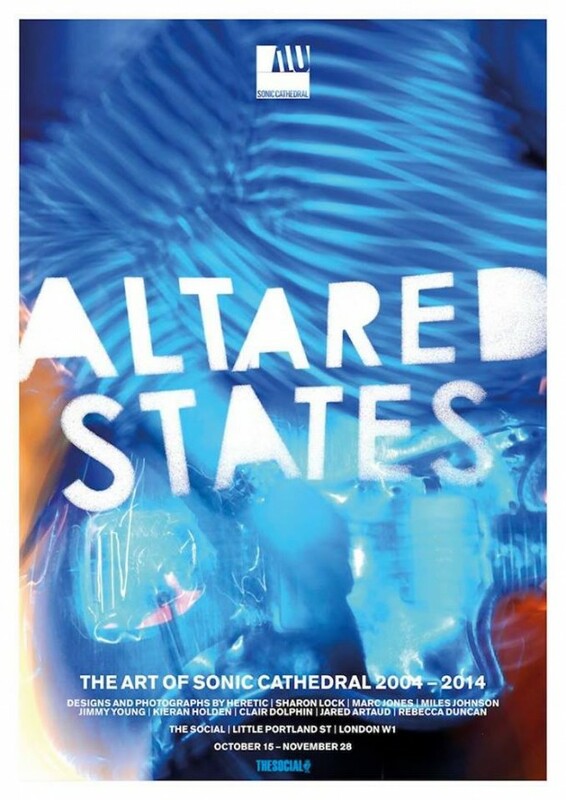 ‘Altared States: The Art Of Sonic Cathedral 2004-2014 will take place at The Social, London W1 and takes a more detailed look at some of the incredible images that have adorned Sonic Cathedral releases, posters and T-shirts over the past decade – including designs by Heretic, Sharon Lock, Marc Jones, Kieran Holden, Miles Johnson, Jared Artaud, Clair Dolphin and Rebecca Duncan. We’ve always been proud of the fact that, even though (from SCR012 onwards at least) there is no Sonic Cathedral house style, everything from record sleeves to flyers has been beautifully, painstakingly designed – andwe’ve been lucky enough to work with some amazingly talented people in order to make this happen. The 13 pieces selected for this exhibition only serve to prove that we’ve followed nicely in the footsteps of Elektra, Factory, 4AD, Creation, Heavenly and all the other labels that inspired us to begin with.